Area code 581 was put into service. Area code 581 is an overlay of area code 418. Area code 367 was put into service as a distributed overlay of area codes 418 and 581 effective November 24, 2018. 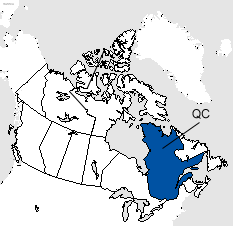 Area codes 418 and 581 cover much of eastern Quebec including the larger communities of Quebec City, Côte-Nord, Chibougamau, Gaspé Peninsula, and Saguenay.